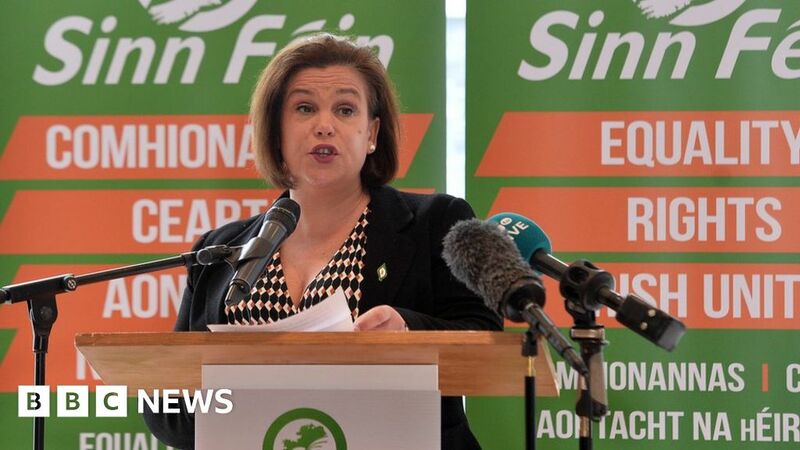 The Sinn Féin president has described Brexit as an act of “political vandalism”. She also blamed the “Tory-DUP pact” for cuts to health and other public services. Ms McDonald was speaking at the launch of the party’s local government election manifesto in Ballymena. The party is standing 155 candidates in next month’s election and many of them gathered for Monday’s launch at the Galgorm Resort. Party leader Ms McDonald said the election was an “opportunity for voters to say the time is up for Brexit and the time is up for DUP Tory cuts”. She said it will be “a local election with a national vision”. The 16-page manifesto sets out the party’s priorities on job creation, housing policing and the environment. “Under the Tory and DUP pact funding for health and public services isn’t even enough to stand still and now they seek to impose Brexit against the will of the people,” Ms McDonald said. She said this was “against the needs of the economy and against the years of progress we have all enjoyed”.